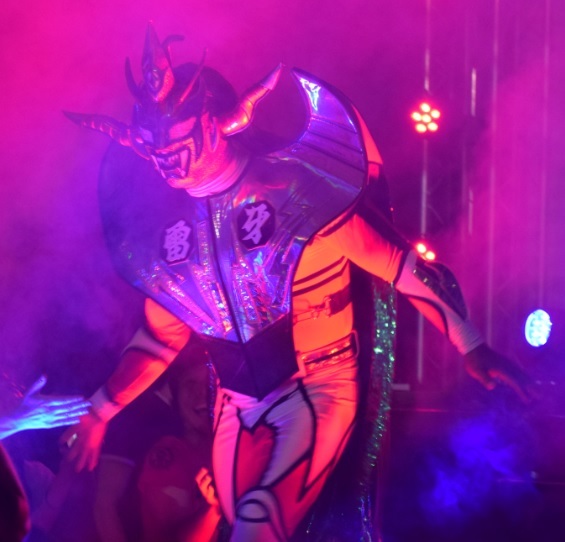 Our previous RevPro road reports have been packed with tales of interactions with wrestlers from the pre-show meet and greet sessions: Tomohiro Ishii’s light-worker handshake, Jushin Liger trying to shill Hiroyoshi Tenzan t-shirts for £300, Liger running around like a madman and pressing himself up against a window like a giant starfish, Tomoaki Honma asking if I wanted to buy a t-shirt and Liger laughing at him when I declined. 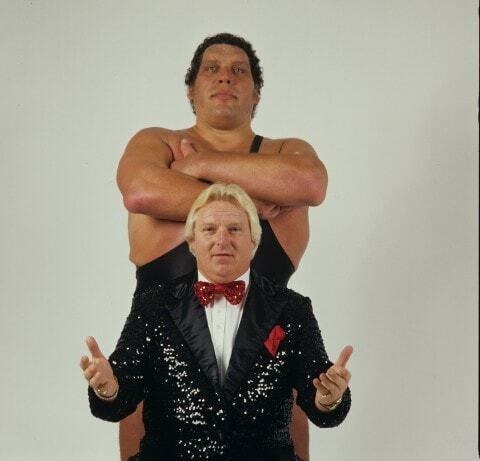 For some reason meet and greet sessions have become somewhat divisive among wrestling fans, as certain people find the idea of paying for a brief encounter and a photograph with another person objectionable on a moralistic level. “Why pay £10 for a mark pic when you could try and catch a wrestler off guard at an inopportune moment for an awkward selfie?” – Is the kind of logic those opposed to the concept of paying for a photo presumably subscribe to. If you fall into this category that’s completely fine, however you should know that some of the best times I’ve ever had at a pro-wrestling events were at the meet and greets. It’s not simply about getting a picture with your favourite wrestler, the whole experience of meeting and interacting with characters you have watched for years – decades in some cases – is completely invaluable and will create memories that last a lifetime. Now after that spiel you might be expecting a fresh batch of stories from the RevPro/ROH pre-show gatherings and if I were any kind of respectable correspondent that would be a perfectly reasonable assumption to make. But, in fear of disappointing the loyal CCN readership, we were unable to attend either of the meet and greets this time around. Usually on these two-day trips we always hit up the meet and greet on the second day, as the logistics of traveling to London make it difficult to show up in time for the first session. RevPro had never run back-to-back show at York Hall before, so every meet and greet we ever attended was not actually held at the famous 88 year-old building. Places like the Walthamstow Assembly Hall and the Rivermead Leisure Complex in Reading were the venues we had become accustomed to for meet and greets; both of which are considerably more spacious than the intimate York Hall. Despite never going to an official meet and greet at York Hall, I have waited in-line to get pictures with certain wrestlers during intermission and it is a logistical nightmare due to the set up and densely compact nature of the building. I can only imagine what it is like when there are ten or more wrestlers doing signings with nearly a thousand people trying to get access to each gimmick table. Without going into too much detail, because this is still a pro-wrestling blog after all, my anxiety scale in public situations can range from “constantly on edge” to “paralysed with fear”, so the idea of sardining myself into the cozy York Hall along with up to a thousand other wrestling fans is not really very appealing. If you are wondering how I can cope with such severe anxiety and still function well enough to even attend a wrestling show at all, just ask my long-suffering girlfriend Bev (@BevGarth) because without her none of these trips would have been possible. Good meds help also. Regardless of the lack of meet and greet content this time around, we still had a few brief encounters of note during the weekend. Upon arrival at the Travelodge hotel – a convenient two minute walk away from York Hall – we were greeted in the lobby by a guy wearing an RPW t-shirt who asked if we were there for, “the wrestling”. After explaining that we had traveled down for both nights and were not going to the meet and greet, he told us that the line for Rey Mysterio was “stupid” and we had probably made the right decision. The mystery man then went on a bizarre tirade – almost like he was practicing cutting a promo – about how “every man gets knocked out just the same” and talked about his rugby playing days getting him ready for wrestling. This lad also told us a story about picking up Jushin Liger from the airport and how the only English Liger spoke to him was, “You…FOOD!” I asked promo-cutting rugby fella if he was waiting for someone, as he was pensively walking around and even asked the receptionist to check for reservations under “Quildan”. He explained that he was waiting for Bully Ray, whom he was supposed to take over to York Hall for the meet and greet but he was running late. We decided to check in to our room before finding out if Bully ever showed up, however considering the match he would have later that night being late to the meet and greet was the least of RevPro’s troubles when it came to Bully. More on that later. Some of the other interactions we had were saying a quick hello to Martin Stone on the way out of York Hall after the Summer Sizzler show, Bev buying a Dalton Castle t-shirt from the man himself during intermission, and bumping into Josh Bodom while getting on the lift at the hotel the next morning. Bodom even returned my pleasantries, which I found amusing since his in-ring persona is the classic douchey heel. The highlight however, was undoubtedly during intermission of the ROH show on night two when Bev and I decided to pop over the road to get a drink from the BP petrol station. As we were waiting in the queue, who should nonchalantly walk into the store but Ultimo Guerrero & Rey Bucanero, fresh off their match just a few minutes before. They were quickly accosted by a few fans who took the opportunity to take the awkward selfies I spoke of earlier, but since the shop wasn’t too busy they managed to buy their eight-pack of Coors Light without too much hassle. We sat on the wall outside the store and I said a quick “hola” to the luchadors as they walked off with their supplies for the evening. Ultimo Guerrero was the one person I actually considered going to the meet and greet to see, so the fact that we happened to run into him in such a random location was a truly wonderful cosmic coincidence. Revolution Pro Wrestling, “Summer Sizzler 2017” – August 17th 2017, York Hall, Bethnal Green London. 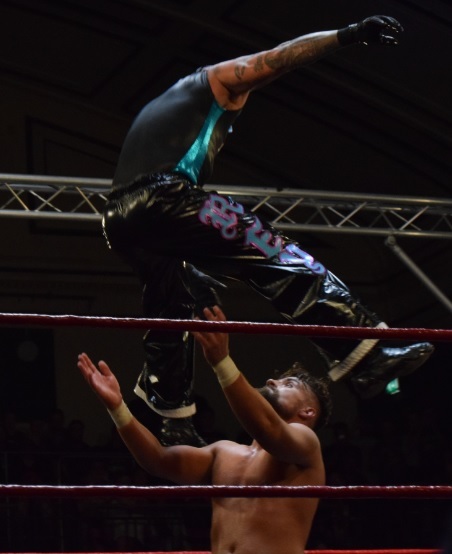 If we are being honest, the first half of the show was most certainly not at the level of some of the previous big RPW York Hall shows, however things picked up after intermission and everything from that point forward was very good. Main event saw Marty Scurll pin Rey Mysterio Jr after a fun match which the crowd were really into. They went nearly 20 minutes, so Rey certainly didn’t come to half-arse it, and the chemistry between the two was on display for all to see as they executed some nice sequences with metronomical timing. Scurll ripped Rey’s mask off at one stage which got some good heat and used his new Bird of Prey move, which is a variation of the Quackendriver I. Scurll won with an inverted Bird of Prey, which is kinda sorta like a modified Yokosuka Cutter. Clearly Mysterio, with his stem cell knees, has been well past his prime for years, however his ability to hide his flaws and work a match to his current strengths is still an impressive feat. 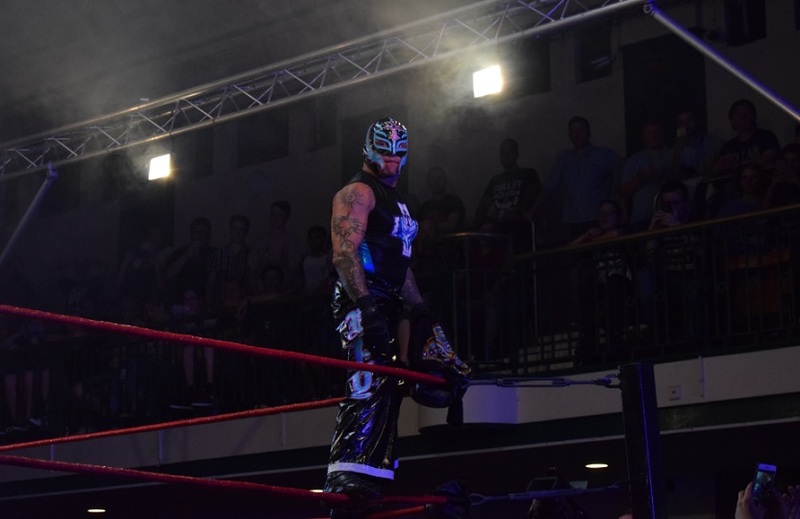 I can’t remember the last time Mysterio had a bad match, and working with Scurll in front of a sold-out York Hall, there was zero chance of this being anything but a main event that sent the fans home happy. (***¾). Semi-main was a battle of the lanky lefties, as Zack Sabre Jr retained the Undisputed British Heavyweight Championship over Chris Brookes. Match was exactly what you would expect from these lads, lots of smooth grappling, crisp strikes and submission attempts. 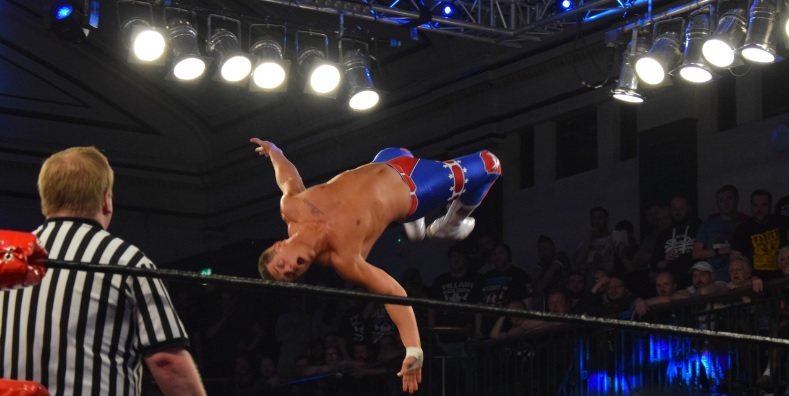 It was Brookes‘ first time on the big stage of York Hall and he rose to the occasion with what may have been his most complete singles performance to date. Brookes eventually hooked the same Octopus-type hold that he submitted Sabre with at the Cockpit in June, but Sabre made it to the ropes then tortured Brookes with some more kicks and submissions. Finish saw Sabre apply his Octopus and he smashed Brookes in the back of the head with vicious strikes until the referee stopped the match for the TKO. Sabre’s killer run as Undisputed British Champion continues. Since he first won the belt back in Janurary 2016 from AJ Styles, ZSJ has blown through challengers like Michael Elgin, Big Damo, Trent Seven, Jeff Cobb, Penta El Zero M, KUSHIDA, and of course there was the multi-match series with Katsuyori Shibata where the two traded the title, culminating with Sabre regaining the gold at New Japan’s 45th Anniversary show in Tokyo, Japan. And that is not including the 40 minute epic Sabre had with Marty Scurll at York Hall back in January of this year. (****). Third from the top saw Josh Bodom retain the Undisputed British Cruiserweight Championship over Jushin “Thunder” Liger in a shockingly fun sprint that went around 7 minutes. 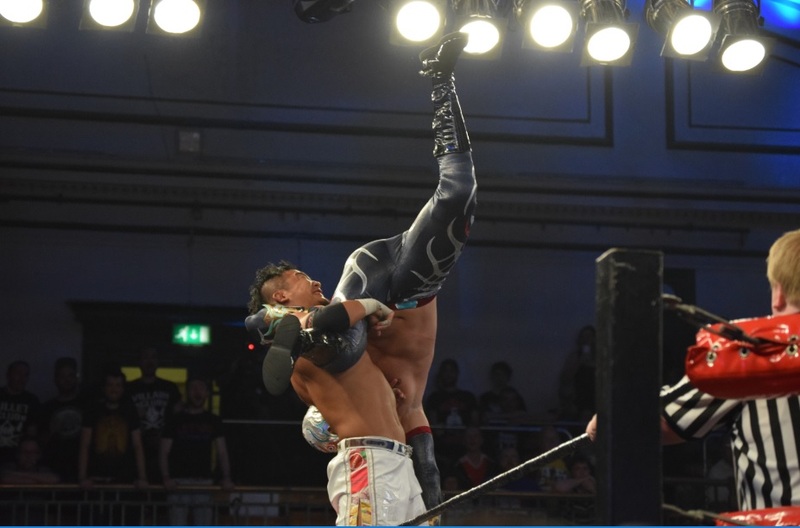 Wasting no time at all, Liger hit the Shotei, Liger Bomb & Brainbuster in quick succession – the same sequence that he beat Bodom with at the British J-Cup – to get a huge near-fall only minutes into the match. Bodom landed some impressive dives and Topes; Liger came back with a Cannon Ball off the apron. Bodom eventually got Liger in position for the Bliss Buster after kicking the rope into his groin and got the dirty victory. Bodom was super impressive here and it was the best I’ve ever seen him perform live in-person. (***½). First match back after intermission had Jay White over Travis Banks in an-all Kiwi affair. The two worked like they had something to prove here on the big stage and delivered an intense battle, with Banks mostly fighting from underneath against the bigger White. Banks hit a huge Coast-to-Coast Dropkick and a low Tope, however, after some physical exchanges, White put him away with a Liontamer. (***¼). As noted the pre-intermission stuff was nothing special, so let’s have a quick look at the results: The Briscoes beat Shane Strickland & Ryan Smile in a fun action packed tag match. Smile was noticeably less over with the crowd after his recent Twitter nonsense, but his in-ring talents are hard to deny and he worked well with Strickland as the young high-flyers against the grizzled vets. Finish saw The Briscoes pin Smile with a Burning Hammer/Double Stomp combo to get the win. (***¼). Zack Gibson defeated Dalton Castle in a good outing with the London Dungeon submission hold. This was all about Gibson’s entrance and pre-match promo, which drew the most heat I’ve experienced in York Hall since Vader/Ospreay. Gibson was serenaded with a chorus of “You’ll Never Walk Alone” by a gang of mock football hooligans during his entrance, all wearing his parody Liverpool FC shirt, then he cut a promo about being the best thing on the UK scene. This act is golden. (***). Bully Ray beat Sha Samuels in a match that was so bad it was edited off the VOD. Bully took it upon himself to add a Street Fight, Falls Count Anywhere, stip before the match started and what followed was possibly the worst match York Hall has seen in years. Bully worked at approximately 5% effort, they brawled in the crowd for a few minutes, and Bully pinned Sha with a Crossbody off the top. That was it. Afterwards, Rob Lias hit the ring as fodder for Bully, who told Sha to get a table and they put Lias through it as an attempt to make up for the disaster of a match. The only good thing about Bully’s appearance was after all the BS, he brought a young kid into the ring and gave him a piece of the broken table as a souvenir. 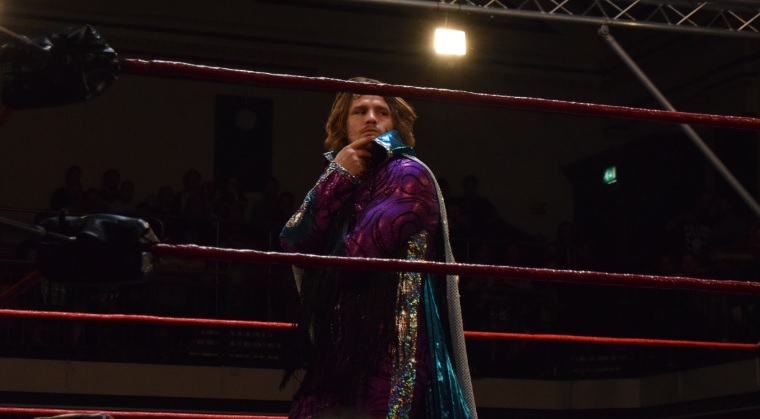 RevPro noted on Twitter that Sha & Lias were not “cannon fodder” and “a small degree of respect goes a long way”, which hopefully means we’ve seen the last of Bully in a RevPro ring. (DUD). Open had Martin Stone over Eddie Dennis with his London Bridge Hangman DDT. 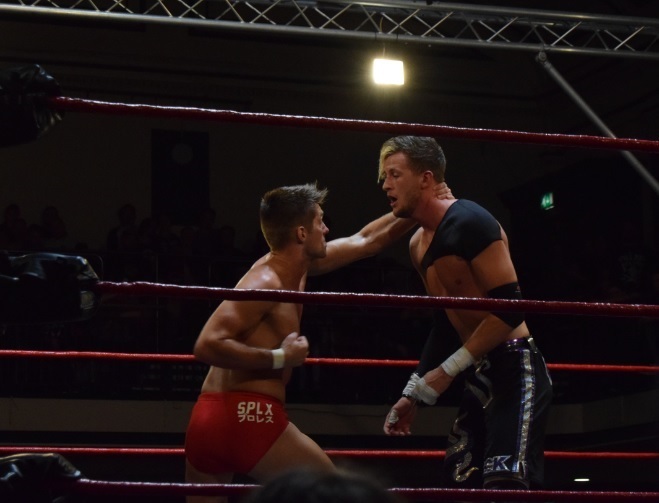 Dennis subbed for Sami Callihan and made his York Hall debut on two days notice. Match was kind of disjointed and Stone flipped between heel and face throughout which made for a weird dynamic. (**¼). To be honest, I was not as excited for this year’s Summer Sizzler as I had been for some of the other York Hall shows. There were a couple of standout matches on paper, but the rest of the card failed to get my hype levels going. Nonetheless, the show ended up being a lot of fun and is definitely worth checking out, especially since big Andy Q axed the Bully Ray debacle which will no doubt make the VOD a much more palatable viewing experience. Ring of Honor, “War of the Worlds: London” – August 18th 2017, York Hall, Bethnal Green, London. As an overall live experience, I actually enjoyed the ROH show more than the RevPro offering, which I would not have necessarily expected going in. 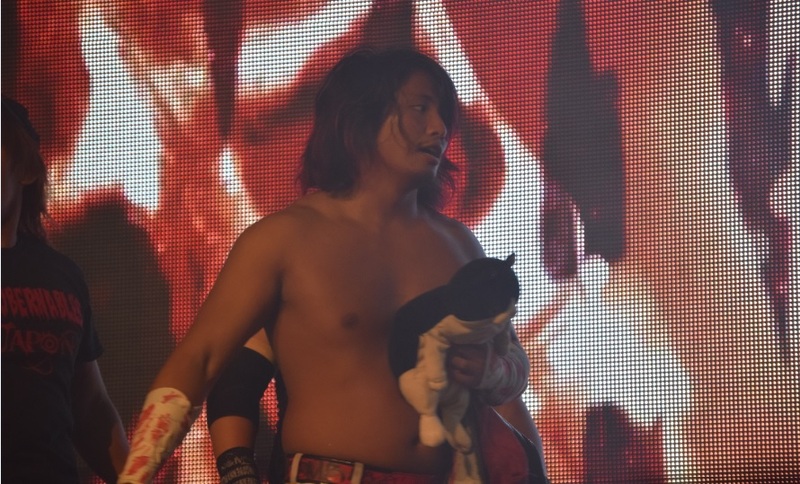 Main event saw Los Ingobernables (Tetsuya Naito, EVIL, BUSHI, SANADA & Hiromu Takahashi) defeat The Bullet Club (Cody, Marty Scurll, The Young Bucks & Adam Page) in an inanity laden spot fest – exactly what this match was meant to be. Everyone got a chance to shine and hit some kind of big move. The highlight of the whole thing was when the Bucks gave poor Daryl the Cat the Meltzer Driver and Hiromu fired up like Steve Austin on all the BC members. Superkicks and dives aplenty. 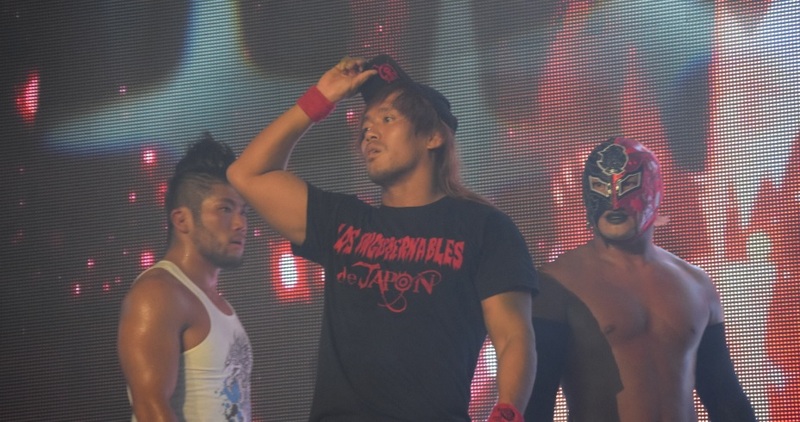 Finish came when Naito pinned Page with the Destino. Afterwards, the Bullet Club closed the show with a promo and Scurll declared that they wanted to run Wembley Arena and said their goal was to draw 10,000 people. (****¼). 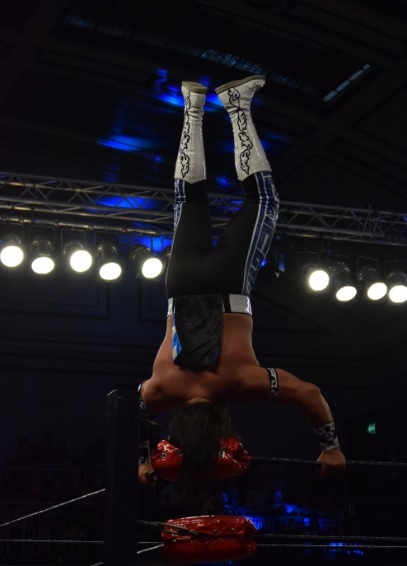 Semi-main event had KUSHIDA retaining the ROH World TV Championship over Titan in the match of the weekend. Titan was announced as the replacement for Atlantis, who underwent knee surgery last month, and while it was a shame that Atlantis couldn’t make it, Titan stole the show and instantly made a name for himself with this performance. Tons of great sequences and big spots. 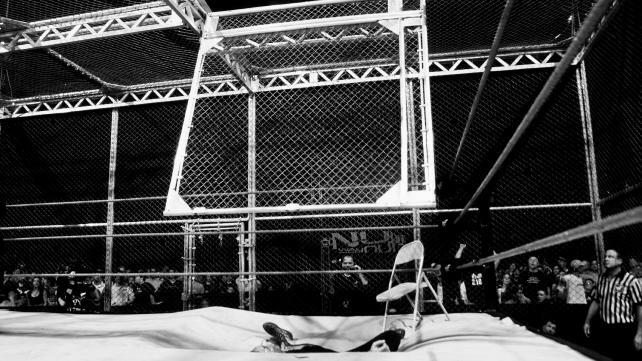 Titan nearly ended his life when he crashed and burned stomach first on the guard-rail after an Asai Moonsault, but he somehow survived to continue the match. KUSHIDA did an awesome rolling Hoverboard Lock off the top and eventually got the win with the Back to the Future. Fantastic match. (****½). Third from the top saw Dalton Castle & The Boys retain the ROH Six Man Tag Team Championship over Jushin “Thunder” Liger, Mistico & Delirious. This was all kinds of fun, with Liger & Castle taking the lead and delivering some fine comedic moments. 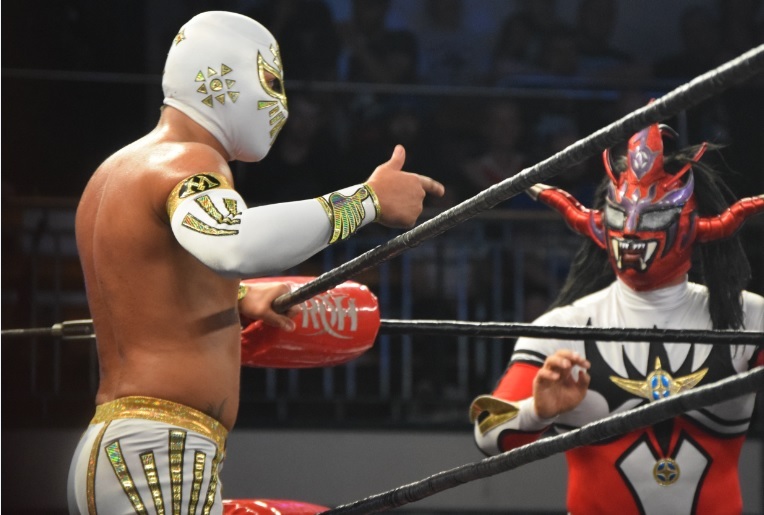 Sadly, Mistico didn’t really get that much of an opportunity to show what he can do. Castle put Delirious away with the Bang-a-rang. (***). Bully Ray beat Jay Lethal, Silas Young, & Sha Samuels in a Four-Way that was at least better than Bully’s effort 24 hours earlier. Bully also got a better reaction from the crowd, which indicates there were more casual/non regulars on the second night. They built to Bully & Lethal doing the “Wassup” spot and Bully pinned Sha with his Crossbody of doom. Post-match, Bully said ECW was his company but ROH belonged to Lethal. (**¾). Jay Briscoe downed Kenny King in a decent match with the Jay Driller. Jay was over, Kenny wasn’t really, so the crowd didn’t really respond to much of the action. (**½). The Addiction (Daniels & Kazarian) over Ultimo Guerrero & Rey Bucanero in a super entertaining outing. 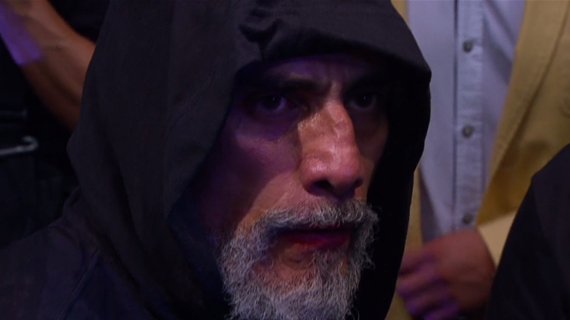 The CMLL guys didn’t really get a huge reaction, but the crowd got into them as the match went along. Guerrero was as great as ever and Bucanero held up his end of the deal too. 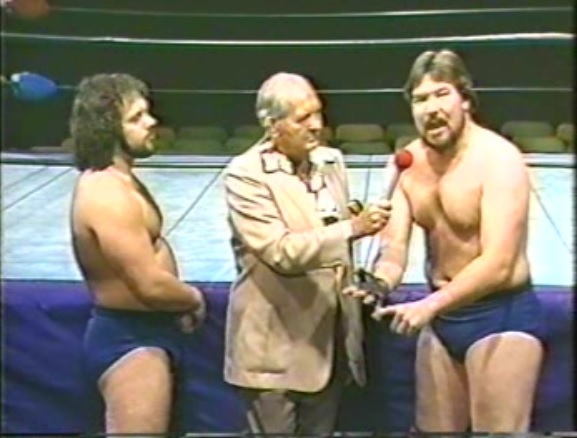 Daniels & Kaz worked well with the luchadors and didn’t seem out of their element at all working a different style. Finish saw Daniels pin Bucanero with his feet on the ropes; Guerrero took out the heels with a big dive to the floor afterwards. (***½). Opener was Mark Briscoe over Ryan Smile with the Burning Hammer. Crowd were into both guys and the match got over well. Smile hit a huge flip dive over the ring post at one stage. Good way to start the show and to set the tone for the rest of the night. (***). 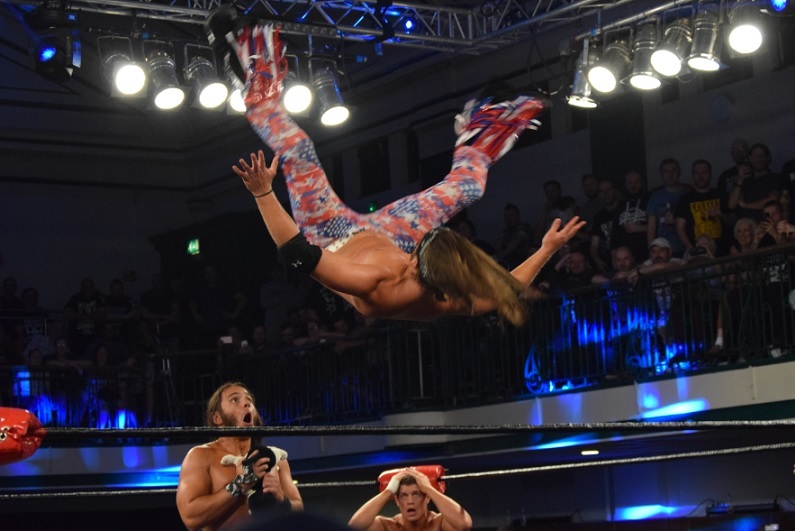 ROH leave a lot to be desired with their TV and PPV product in terms of production – or lack thereof – however this show at least illustrated that ROH can still deliver a great night of live wrestling when they want to. Of course, the international imports certainly helped with the quality and diversity of this particular event. Well, that’s it for another CCN road report. Thank you all for reading and we’ll hopefully see you soon. All photos, credit: @BevGarth (Instagram). WWE FastLane 2016 Review – The Road to Nowhere. WWE RAW Review March 21st 2016 – Lonely Road of the Top Babyface & Another Bad Show.